In the buildup to my Roomba fighting event I have pondered how to actually go about this quite often and I haven’t really admitted that I felt a little bad for them. In fact I was trialling how to attach the target and weapon to them and felt a moment of pity. So they’ve sat in my lounge room like this for the last few days. Apparently I have the worlds most tolerant housemate. Like a tiny, sad, going away party frozen in time. 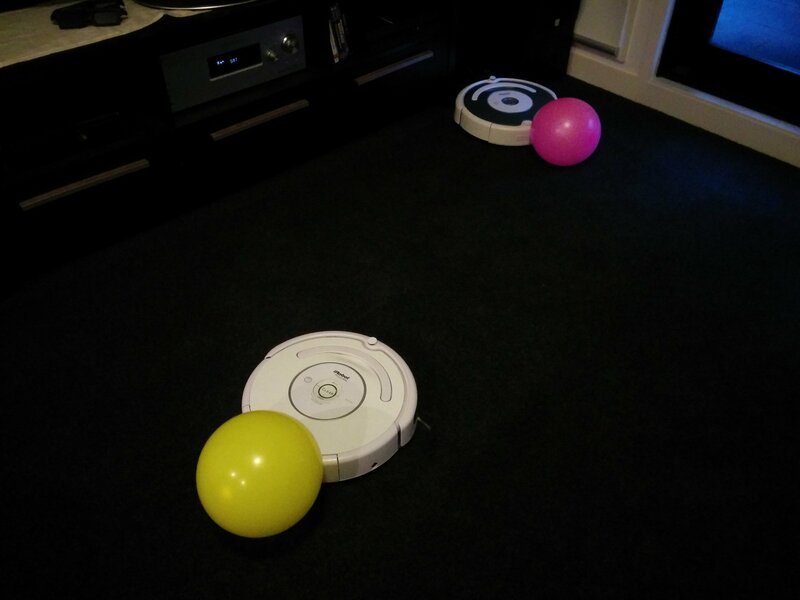 While they sat there, I wrote my previous post on Roomba Anthropology and I think it’s quite obvious that I came to the conclusion that these guys are assholes. As the pity burnt away I decided that they are definitely going to fight! So it’s time to build an arena. I could just let them go at it in my lounge room, but I like my couches as they are. 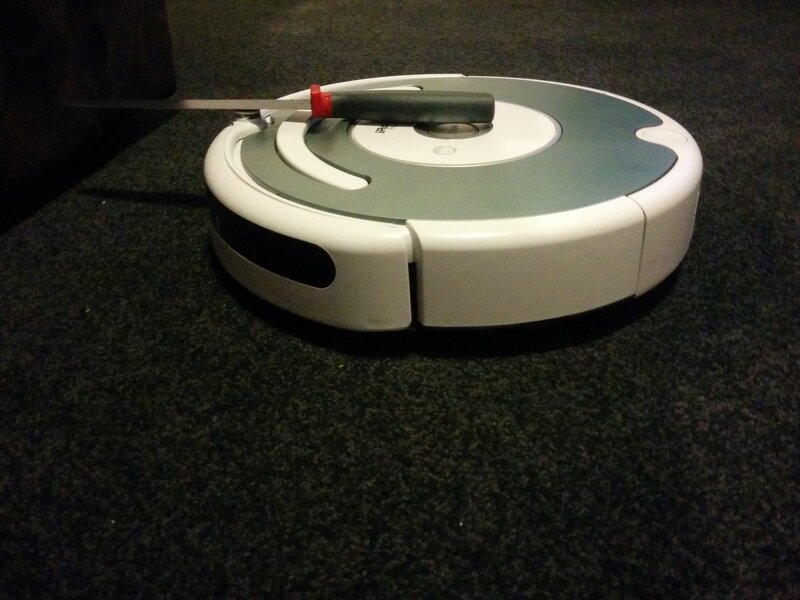 With the knife sticking out like that, the Roomba won’t use it’s bumper to hit the object and turn around. 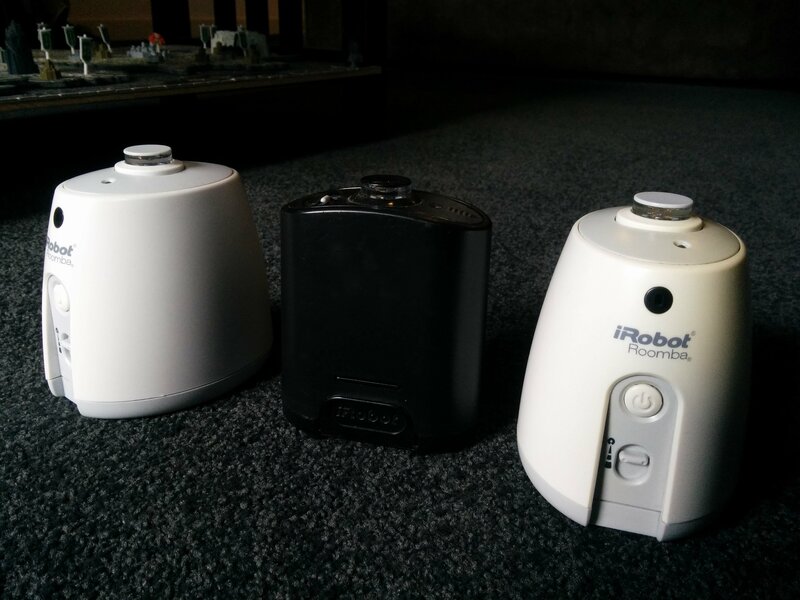 So I’m going to have to keep the Roombas away from things. Fortunately we already have a solution. The invisible barriers or IR walls. I wanted a square arena, but I only have 3 walls. I could concede to a triangle or at worst buy another wall. But there’s a neat little trick I came up with. 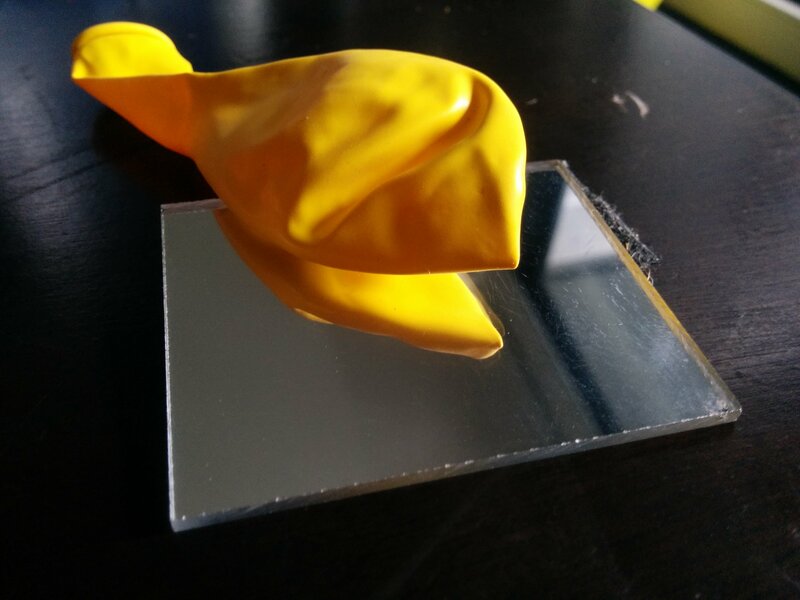 If you haven’t guessed it from the image, I’m going to use that little shaving mirror to reflect the beam from one wall and use it to create the missing perpendicular wall. I mean it’s just light when it comes down to it. My apologies for the dark video, but the testing here has the wall pointing away from the Roomba then reflecting back towards it and creating a different angle wall. The Roomba hits the wall and turns as I had hoped. And it worked just fine in the full size test. So the only thing I really have to worry about now is the balloon blocking the path of the IR. While I could combat this by adding more towers or doubling up on the reflected walls, I think it will be easier to just have an umpire to reset any runaways. Thank god I’m using slow Roombas or that would be a very dangerous job. Although that does give me some ideas for something that could be heaps of fun later. LOL, this is a very valid point. Though I would imagine if it were more than just balloons and pointy things, there’d be more mess. Robot corpses etc. 🙂 I think at that point, I’d best hold these things outside.